Included here is the introduction from the PhD thesis of our head dietitian Anne Swain. This study commenced at Royal Prince Alfred Hospital (RPAH) in April 1977, after Dr. R.L. Clancy (Staff Immunologist) became interested in the possible role of dietary substances in the pathogenesis of recurrent idiopathic urticaria and angioedema (RIU/AO). During the 1960's and 1970's several authors had reported that a number of chemicals present in food could precipitate acute exacerbations of RIU/AO and that diets designed to exclude these substances often induced prolonged remission (Warin, 1960; Moore-Robinson & Warin, 1967; Champion et al., 1969; James & Warin, 1970; Lockey, 1971; Juhlin et al., 1972; Michaelsson & Juhlin, 1973; Warin & Champion, 1974; Doeglas, 1975; Thune & Granholt, 1975; Warin, 1976; Warin & Smith, 1976; Ros et al., 1976; Settipane et al., 1976; Doeglas, 1977). The chemicals that were implicated included the naturally occurring salicylates in food as well as artificially added preservatives and colourings. RIU/AO is a common condition generally treated symptomatically with a variety of antihistamines, the side effects of which are often limiting factors. As a result of the favourable findings reported by Warin and Smith (1976) Dr. Clancy decided to investigate dietary management as an alternative, and approached Ms. M. Hosking (Head Therapeutic Dietitian) in order to develop a suitable elimination diet. At this time the author was consulted while working as an intern dietitian in the Dermatology Ward at RPAH. Under the guidance of Ms. M. Hosking and Ms. J. Rogers (Head Food Services Dietitian), and after reviewing the available literature on diet and RIU/AO, an elimination diet was formulated and the study commenced (Gibson & Clancy, 1978). It had been known since the turn of the century that aspirin ingestion could precipitate acute urticaria (Hirschberg, 1902) and more recently Calnan (1957, 1964) noted that aspirin could also trigger recurrences in many patients with RIU/AO. Warin (1960) had reported that 22 of 70 patients with RIU/AO developed exacerbations after administration of aspirin. Subsequently, Moore-Robinson and Warin (1967) reported an incidence of 22% in 228 patients and Champion et al. (1969) found that 21% of 268 patients with RIU/AO reacted to aspirin. James and Warin (1970) gave test doses of aspirin to 96 patients with RIU/AO in a "single blind" manner, and 37 of them developed an urticarial reaction to the challenge. In 1959, 1969 and 1971, Lockey reported the role of azo dyes derived from coal tar, particularly the yellow dye tartrazine, in RIU/AO. Juhlin et al. (1972) showed that in seven out of eight aspirin-sensitive patients similar exacerbations occurred with tartrazine, as well as with certain benzoates used as preservatives. In 1973 Michaelsson and Juhlin reported 52 patients who were challenged with aspirin, sodium benzoate, 4-OH benzoic acid, and three azo dyes tartrazine, sunset yellow and new coccine. Of these, thirty five reacted to aspirin, twenty seven to benzoic acid compounds and twenty seven to azo dyes. Doeglas (1975) had performed similar provocation tests, and in 23 patients with RIU/AO known to react to aspirin, 30% reacted to tartrazine, 17% to sodium benzoate and 15% to 4-OH benzoic acid. Using a battery of challenge tests Thune and Granholt in 1975 and Warin and Smith, and Ros et al. in 1976 also identified a group of RIU/AO patients who reacted to salicylate, tartrazine, sodium benzoate and 4-OH benzoic acid. Settipane et al. (1976) challenged 38 patients with tartrazine in whom there was an eight percent positive response. Several of the above authors had reported that diets designed to exclude foods containing salicylates and/or additives induced prolonged remission of urticaria in those patients who had shown a positive response to oral challenge with these compounds (Michaelsson and Juhlin, 1973; Doeglas, 1975; Warin, 1976; Warin & Smith, 1976; Ros et al., 1976; Doeglas, 1977). Seventy-five percent of the patients studied by Warin and Smith (1976) became either asymptomatic or improved after being on an appropriate diet for a two-month period. This improvement was similar to the results obtained by Michaelsson and Juhlin (1973) and Doeglas (1975). In 1976, Ros et al. found that in 59 patients with RIU/AO who reacted to challenge with salicylates, preservatives and azo dyes, a diet designed to reduce consumption of these items resulted in complete remission in 24% and improvement in 57%. Our approach to the identification of dietary chemicals which contribute to the pathogenesis of RIU/AO was similar to that of Warin and Smith (1976). An important difference, however, was our attempt to establish a stable asymptomatic remission prior to challenge, using a baseline diet constructed to exclude all the test substances (Gibson & Clancy, 1978). This approach had the dual advantage that patients would be able to discontinue antihistamines, which might otherwise mask challenge reactions, as well as reducing background symptoms from substances included in a normal diet which might otherwise produce false positive results. The low response rate with the lactose placebo in this study emphasized the importance of removing this background "noise" and contrasts with the experience of other workers (Michaelsson & Juhlin, 1973; Doeglas, 1977). We began with a diet based mainly on the elimination diets of Rowe (1944, 1972), Shelley (1964), Feingold (1968) and Warin (1976) designed to exclude the common food "allergens" as well as salicylates, preservatives and azo-dyes, but clinical experience with our first two patients suggested that this information was inadequate. Since pineapple and pears were the only fruits allowed, both patients consumed large amounts of pineapple juice and fresh pineapple, and detailed review of the literature revealed that, where available, analytical data on the content of salicylates and benzoates occurring naturally in foods was incomplete, scattered, and sometimes contradictory (Table 2.6), and much of the published information was not relevant to the Australian diet. It was therefore decided to underly eaten foods under the supervision of Professor A.S. Truswell in the Human Nutrition Unit, University of Sydney. This work, described in Chapter 2, was completed in 1983 and led to a number of modifications of our original elimination diet (Gibson & Clancy, 1978; Allen et al., 1984). Dr. Clancy left RPAH in 1978, and clinical evaluation of patients undergoing dietary elimination and challenge testing continued with Professor A. Basten, Drs. P. Gatenby, S. Krilis and S. Van Nunen. The clinical features and results of immunological and other investigations in the first 76 patients with RIU/AO were published in 1980 (Gibson & Clancy). In 1980 Dr. R.H. Loblay joined the RPAH Allergy Clinic as Clinical Immunologist. By the following year it was becoming increasingly evident to us, as well as others (Juhlin, 1981), that patients with RIU/AO sometimes also experienced abdominal pain, diarrhoea, headache, respiratory and/or constitutional symptoms when undergoing blind challenge with various food substances. It was found that elimination of the relevant foods sometimes resulted in dramatic improvement in chronic symptoms of this kind, even when RIU/AO was only a minor component of the clinical presentation. Since 1981 there has been a gradual change in the spectrum of patients attending the RPAH Allergy Clinic (Figure 1.1). This was partly due to the dissemination of the protocol to other hospitals and practitioners who were then able to manage patients with uncomplicated RIU/AO in the same way, so that those referred to RPAH tended to have more complex or unusual clinical presentations. Another factor was the increasing public interest in "food allergy" which in the late 1970's and early 1980's was widely promoted by fringe and alternative practitioners as being responsible for a vast array of symptoms and diseases (Feingold, 1975; Airola, 1977; Mackarness, 1980; Crook, 1984). 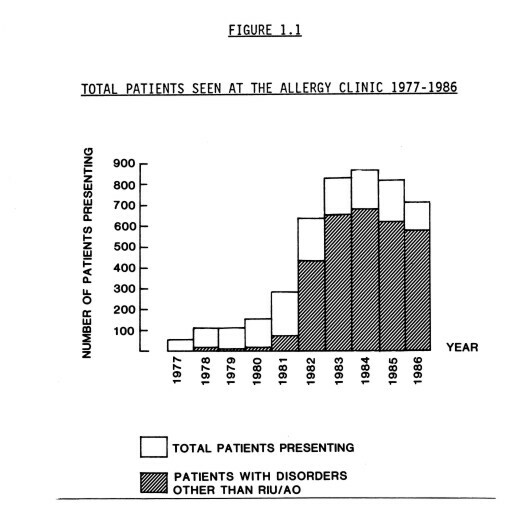 By 1982 the Allergy Clinic at RPAH had become well known for its interest in food intolerance, and many patients were therefore referred with a variety of clinical problems, which they suspected might be attributable to dietary factors. These included migraine, irritable bowel syndrome (IBS), asthma and eczema, as well as patients who experienced symptoms referable to multiple organ systems, often together with vague constitutional symptoms suggestive of psychoneurosis. This latter group of patients was designated as having "systemic" symptoms. A Pediatrician, Dr. V. Soutter, also began attending the Clinic in 1981, and a significant number of "hyperactive" children have undergone dietary evaluation since then. Clinical observations suggested that in patients with syndromes other than RIU/AO milk, wheat, natural amines (Hanington, 1967), monosodium glutamate (MSG) (Kwok, 1968; Schaumberg et al., 1969), and a variety of other food additives might also be implicated in provoking some of these symptoms, and a more stringent elimination diet was designed for the investigation of such patients. At the same time the range of challenge substances was extended, and starch and sucrose were introduced as placebos in place of lactose, which was sometimes found to provoke abdominal symptoms. Since many of these additional symptoms were of a subjective nature the challenge protocol was made "double-blind", with numbered challenge capsules administered in an arbitrary order. The clinical characteristics, dietary investigation and management of patients with these syndromes other than RIU/AO are described in Chapter 6. in the final Chapter the results of the previous chapters are discussed. Observations about the range of food chemical implicated, the symptoms provoked on challenge and the clinical behaviour of reactions provided valuable clues as to the underlying mechanisms of adverse food reactions. AIROLA, P. (1977): Hypoglycaemia: A Better Approach. Health Plus. Phoenix, Arizona. ALLEN, D.H., VAN NUNEN, S., LOBLAY, R., CLARKE, L. and SWAIN, A. (1984): Adverse reactions to foods. Med. J. Aust.,2 S37 - S42. CALNAN, C.D., (1957): Release of histamine in histamine pigmentosa. Lancet, 1:737-738. CALNAN, C.D., (1964): Urticarial reactions. Br. Med. J., 2:649-655. CHAMPION, R.H., ROBERTS, SO.O.B., CARPENTER, R.G. and ROGER, J.H. (1969): Urticaria and angio-oedema. A review of 554 patients. Br. J. Dermatol., 81:588-597. CROOK, W.G. (1984): The Yeast Connection. 2nd Edition. Professional Books, Jackson, Tennessee. DOEGLAS H.M.G. (1975): Reactions to aspirin and food additives in patients with chronic urticaria, including the physical urticarias. Br. J. Dermatol., 93:135-144. DOEGLAS, H.M.G. (1977): Dietary treatment of patients with chronic urticaria and intolerance to aspirin and food additives. Dermatologica, 154:308-310. FEINGOLD, B.F. (1968): Recognition of food additives as a cause of symptoms of allergy. Ann. Allergy, 26:309-313. FEINGOLD, B.F. (1975): Why your child is hyperactive. Random House, New York. GIBSON, A.R. and CLANCY, R.L. (1978): An Australian exclusion diet. Med. J. Aust., 1:290-292. GIBSON, A.R. and CLANCY, R.L. (1980): Management of chronic idiopathic urticaria by the identification and exclusion of dietary factors. Clin. Allergy, 10:699-704. HANINGTON, E. (1967): Preliminary report on tyramine headache. Br. Med. J., 2:550-551. HIRSCHBERG. (1902): Mittheiling uber ein Fall von Nebenwirkung des Aspirin. Deutsche Medizinische Wochenschrift, 28:416. JAMES, J and WARIN, R.P. (1970): Chronic urticaria: The effect of aspirin. Br. J. Dermatol., 82:204-205. JUHLIN, L., MICHEALSSON, G. and ZETTERSTROM, O. (1972): urticaria and asthma induced by food-and-drug additives in patients with aspirin hypersensitivity. J. Allergy Clin. Immunol., 50:92-98. JUHLIN, L. (1981): Recurrent urticaria: Clinical investigation of 330 patents. Br. J. Dermatol., 104:369-381. KWOK, R.H.M. (1968): Chinese restaurant syndrome. N. Engl. J. Med., 278:796. LOCKEY, S.D. (1959): Allergic reactions due to FD&C yellow no. 5 tartrazine, an aniline dye used as a coloring and identifying agent in various steroids. Ann. Allergy, 17:719-721. LOCKEY, S.D. (1969): Chronic urticaria and generalized urticaria due to FD&C dye 5 present in foods and drugs as a coloring agent. Scientific Exhibit "Hidden Allergens", AMA Annual Convention, New York, July 13-17, 1969. LOCKEY, S.D. (1971): Reactions to hidden agents in foods, beverages and drugs. Ann. Allergy, 29:461-466. MACKARNESS, R. (1980): Chemical Victims. Pan Books Ltd., London. MICHAELSSON, G. and JUHLIN, L. (1973): Urticaria induced by preservatives and dye additives in food and drugs. Br. J. Dermatol., 88:525-532. MOORE-ROBINSON, M. and WARIN, R.P. (1967): Effects of salicylates in urticaria. Br. J. Med., 4:262-264. ROS, A-M., JUHLIN, L. and MICHAELSSON, G. (1976): A follow-up study of patients with recurrent urticaria and hypersensitivity to aspirin, benzoates and azo dyes. Br. J. Dermatol., 95:19-24. ROWE, A.H. (1944): Elimination Diets and the Patient's Allergies. Lea & Febiger Publishing Co., Philadelphia. ROWE, A.H. and ROWE, A. Jr. (1972): Food Allergy: Its Manifestations and Control and The Elimination Diets. A Compendium. Charles C. Thomas. Springfield, Illinois. SCHAUMBERG, H.H., BYCK, R. and MASHMAN, J.H. (1969): Monosodium L-glutamate: its pharmacology and role in the Chinese restaurant syndrome. Science, 163:826-828. SETTIPANE, G.A, CHAFEE, F.H., POSTMAN, I.M., LEVINE, M.I., SAKER, H.H., BARRICK, R.H., NICHOLAS, S.S., SCHWARTZ, H.J., HONSINGER, R.W. and KLEIN, D.E. (1976): Significance of tartrazine sensitivity in chronic urticaria of unknown etiology. J. Allergy Clin. Immunol, 57:541-546. SHELLEY, W.B. (1964): Birch pollen and aspirin psoriasis. A study in salicylate hypersensitivity. J. A. M. A., 189:985-988. THUNE, P. and GRANHOLT, A. (1975): Provocation tests with antiphlogisitci and food additives in recurrent urticaria. Dermatologica, 151:360-367. WARIN, R.P. (1960): The effect of aspirin in chronic urticaria. Br. J. Dermatol., 72:350-351. WAIN, R.P. and CHAMPION, R.H. (1974): Urticaria. Volume 1 in Major Problems in Dermatology. Saunders, London. WARIN, R.P. and SMITH, R.J. (1976): Challenge test battery in chronic urticaria. Br. J. Dermatol., 94:401-406. WARIN, R.P. (1976): Chronic urticaria. Br. Med. J., 2:882-883. WARIN, R.P. (1976): Food factors in urticaria. J. Hum. Nut., 30:179-186.